For the BJP, this murder seemed like a godsend opportunity to divert attention at the national and state level from other burning issues. Press conference was called by the RSS leader Dattarey Hosabale demanding a possible president’s rule in the state. The campaign which followed this press conference was not limited to portraying the CPM as a violent organisation. It portrayed the entire state as a killing field for RSS activists consisting of a social atmosphere which was more violent than any other state. In fact, #killingfieldsofkerala was trending in Twitter. With the help of servile national media houses like Republic, Times Now and Zee News, there was a one sided portrayal of the violence in Kerala with the RSS being the victim and the CPM being the villain. 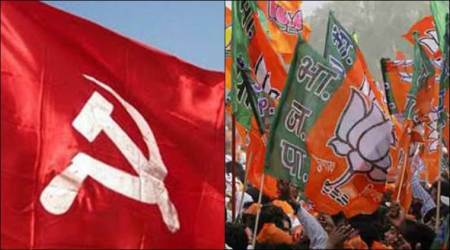 The political clashes between the CPM and the RSS in Kerala have a long history. But unlike the claims made by the RSS, they are not innocent lambs in the whole episode. More than often, they have been the initiators of violence. Clashes between these two organizations started in late 1960s when the RSS tried to attack beedi workers in Kannur district on behalf of their emlpoyers. It was similar to the attack waged by Shiv Sena against the Left trade union members in Bombay. This violence of Shiv Sena was responsible for destroying the strong trade union movement in Bombay. But unlike Bombay, violence against working class was resisted in Kerala. In most cases, when the RSS suffered casualties, it has been because of this strong resistance of the Left against such arm-twisting tactics of RSS. It was not only trade unions which were under attack from the RSS. In Thalassery area of Kannur district, attempts were made by the RSS to communalize the society. This region has a strong minority population and naturally it became an area of interest for them. Riots erupted, and here also, it was the Left which resisted the RSS. CPM cadres died trying to protect mosques from RSS attack in this episode. Even Justice Vithayathil Commission which investigated the Thallassery riots underlined the role played by RSS in instigating the riots. Since then, periodically political violence has erupted in different parts of Kerala. But unlike the claims of RSS, they have not been passive victims in this episode. Most of the times, they were active perpetrators. The data on murders also point to that fact. Since 1970, 527 CPM cadres have been killed. All other parties combined have had 445 causalities. RSS/BJP has suffered 185 causalities. In the murder of CPM members, 225 times, cases were filed against RSS/ BJP members. This data is not something which the CPM has released. Kerala police has provided with this data. Therefore, it is crystal clear that the attack is not one sided. Rather, the CPM is at the receiving end of the political violence inflicted by RSS. Even in the current tenure of the LDF government, it is not the CPM which has started attacking the RSS. Immediately after the election results were announced, a CPM cadre was killed in Dharmadam, the constituency of Chief Minister Pinarayi Vijayan, by RSS. Around the same time, a CPI MLA from Kaasrcode district was attacked by the RSS while attending the victory procession and both his hands were broken. Causalities from both sides have been approximately equal in these months. It is therefore, clearly not the case that the RSS is a victim even in the recent sprout of political violence. At the same time, it is important to understand that the violence inflicted by the RSS has not being limited to the political sphere. In the last one year, there have been two murders in Kerala which were thoroughly communal in nature. Two victims, Riyas Maulavi and Faisal were killed solely because of their Muslim identity. The accused in both the cases belong to the RSS. A pointer towards the nasty, criminal record of RSS with respect to violence in the state. With national media houses like Republic and Times Now under control, the BJP believed that they could reap political harvests from the entire episode. It is also possible that by creating hysteria in other parts of the India against Kerala, they actually intended to impose a presidential rule in the state. Presidential rule becomes important since for BJP, it is an impossible task to win Kerala. Not only is the demographic variables stacked against them (a very strong percentage of minorities), there is a strong sense of political and ideological partisanship among lower castes in Kerala towards the Left which makes the possibility of wining even assembly seats impossible, forget capturing state power. They have not moved an inch forward since the last Assembly election and unlike many other states; it is not possible for them to buy MLAs from other parties. It is with these agendas that Arun Jaitley visited Kerala and a frenzied campaign was initiated against the Left and Kerala at the national level. But this backfired in all directions. For the first time ever, there was a systematic political campaign by the Left in social media. It was sharp, organized and to the point. The Left finally arrived in the social media scene which was monopolized until then by the BJP and Aaam Admi Party. With data, systematically, the myth of RSS being the victim in Kerala was demolished. Crime bureau statistics was shown to show the miserable law and order situation in the BJP governed states. Not only the Left, the attempt to portray Kerala as a Talibanised region did not go well with the Congress supporters or even with non political Malayalees. So much was the anger against national media for hyping up the situation and portraying a one sided narrative, that a social media campaign was unleashed by Malayalees against these bootlickers of BJP. Face book rating of Republic TV plunged from 4.7 to 2.2 within a day as a result. Rahul kanwal from India today who came with his preplanned agenda to defame the state had to backtrack on his stand regarding Kerala violence. He accepted that a one sided picture was projected by the national media. Overall, it was a moment in which a regional identity got manifested itself as strong progressive secular identity and that is something which any self-respecting Malyalee should be proud of. This unity was reflected even among the television channels of Kerala barring few. The nature of discussions was diametrically opposite to that of national channels. Here, even the rabidly anti-CPM channels strongly questioned the RSS intention of imposing presidential rule in the state. Discussions of this nature continue to this date in Malayalam channels. It was not a situation which the BJP/RSS combo expected when this whole affair started. At the same time, considering the political setback which the BJP faced, it is possible that they are going to up the ante of campaign. Already, there are rumors that Amit Shah and Yogi Adityanath are planning to the visit the state. Provocative statements are going to be made to instigate communal and political violence. Hopefully, it will be resisted by Kerala in a united manner. The entire episode shows the stubborn nature of Kerala society when it comes to resisting fascism. It is a shining light in fight against fascism despite its small size and population, something which every Malayalee should be proud of. For the entire country, this small state has become a symbol of hope in resisting BJP. In these dark times, let us hope that there will be many more Keralas.